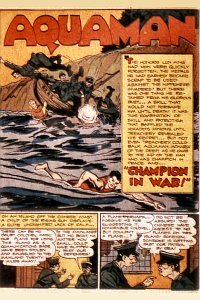 More Fun #96 (March 1944) - Champion in War! Lun Ming, an Olympic swimmer, fights the Japanese invaders in China by smuggling messages from his home island to the mainland. I have a soft spot for this story, despite the stereotypes in it. It was the first Golden Age Aquaman tale I ever read, on a really low quality photocopy made from a microfilm of the book. In addition, my husband loves the Olympics and this is an early mention of the Olympics that shows that people didn't understand the Games much. Aquaman first meets Lun Ming when both of them are on missions. Aquaman says he would help, but is on a mission of his own. He comes back later during a storm and saves Lun Ming. Even later, Aquaman is visiting the island and learns that Lun Ming was captured. Finny Friends Report: Aquaman gets no assistance from sea life in this tale. Captured/Knocked Out report: Aquaman is never caught or knocked out, but he does break into jail. Quotefile: Lun Ming: "Can't a man go for a swim in the moonlight here without being threatened?"